So as most of you probably know Mike and I took another trip to Disney. Twice in one year, I truly am spoiled I know. I just feel such a strong connection to vacationing there. We are able to leave reality and immerse ourselves into a world of fantasy, it's much easier living in a fantasy world than reality, wouldn't you agree? Anyways, getting to the point of the post... so of course we brought Aidan along with us to leave a bit of him there. Just like in Disneyland we left him with the lost boys in neverland. Got a much better shot of exactly where he is then while in Disneyland. You can see it below. We also wanted to find a new spot, so in typical Laura style I'm on the lookout for the "sign" of where he would like to be. After a few days we couldn't think of any place that really stood out, alot of OUR favorite rides we think would be a little too scary for Aidan to hang out, such as pirates of the caribbean and haunted mansion. Mike always teases saying "maybe when he gets older he can stay here." We also joked about Aidan being the youngest person to get to ride on Expedition Everest. Sorry went off on a tangent again, haha. Continuing on... so Mike had emailed his Dad to let him know how our trip was going and saying how we were trying to find a good spot. He told us to check out Tom Sawyer Island. The next day we were going to Magic Kingdom so we figured we would look around. As we were exploring the island, walking through caves and across bridges, we came across this really super bright and sunny spot amidst lots of trees. We paused here for a second and noticed this little yellow and black butterfly flittering around in the branches. We stayed and watched it dancing around in the sky for a few minutes and then we continued to explore. While exploring, we noticed that the butterfly was following us around. After we had walked the island we began discussing if this would be a "spot." We deliberated some and decided that it would be fitting to leave a part of him where we first encountered the beautiful butterfly. 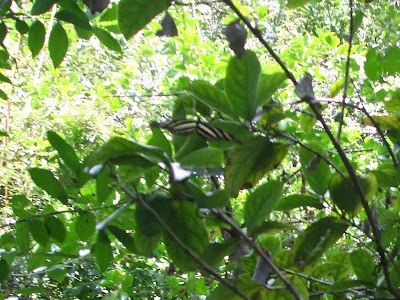 As we trekked back to the area we heard some running water flowing like a waterfall and noticed that the area where we met the butterfly was unusually denser than the rest of the island. We realized that it was calming and serene just like Aidan's jungle crib soother. It was then that we knew that it was a perfect spot. When we got back there the butterfly was waiting for us. We hung out for a few minutes and chatted with Aidan and the butterfly. I'm jealous, Aidan travels more than I do.